Clinton, Michigan - Eden organic canned Roma tomatoes have four new varieties. Eden® Organic Crushed Tomatoes w/ Roasted Onion & Roasted Garlic ~ Organic Roma Tomatoes, Organic Minced Onion, and Organic Roasted Minced Garlic, 28 ounce. Eden® Organic Crushed Tomatoes w/ Sweet Basil ~ Organic Roma Tomatoes and Organic Dried Basil, 14.5 and 28 ounce . 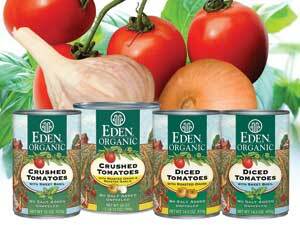 Eden® Organic Diced Tomatoes w/ Sweet Basil ~ Organic Roma Tomatoes, Organic Dried Basil, and Organic Roasted Garlic, 14.5 ounce. Eden® Organic Diced Tomatoes w/ Roasted Onion ~ Organic Roma Tomatoes, Organic Roasted Minced Onion, and Organic Roasted Minced Garlic, 14.5 ounce. These four new tomatoes join the existing five flavors: Eden Organic Crushed Tomatoes, Organic Diced Tomatoes with Green Chilies, Organic Diced Tomatoes (original 14.5 and NEW 28 ounce size); Organic Whole Tomatoes, and Organic Whole Tomatoes with Sweet Basil. Each flavor of Eden Organic Tomatoes has a new updated label with complete nutritional and product information. All are low calorie, fat free, very low sodium, a good to excellent source of beta-carotene vitamin A and vitamin C, and contain the antioxidant lycopene. As always our cans are white enamel lined to further protect flavor and integrity. Eden Organic Tomatoes are the flavorful Roma variety, organically grown on the third generation Kerr family farm in the Thames River Delta of southern Ontario, Canada. Bob Kerr's careful tending and mineral rich organic soil, enriched with a consummate composting and crop rotation program, produces deep red Roma tomatoes that taste and nourish even better after they're cooked. The tomatoes are harvested at the peak of red ripeness and fresh packed within hours of picking. All are hand sorted and washed. Crushed Tomatoes are left unpeeled, ground, cooked, and passed through a screen. Diced Tomatoes, also left unpeeled, are chopped and cooked. Whole Tomatoes are naturally peeled by hot water scalding and light brushing to loosen and remove their skin; visually inspected, and cooked in fresh organic tomato juice. The vegetables added to Eden Organic Tomatoes, like the tomatoes themselves, are the finest quality, family farm certified organically grown. Eden Organic Tomatoes with Basil are cooked with a generous amount of organic dried sweet basil. Other basil labeled tomatoes that we found are made with a small amount of fresh basil and have a very diluted to nonexistent basil flavor. A healthy dose of organic dried sweet basil was essential in getting the flavor right. Commercial tomatoes are synthetically fed, often travel hundreds of miles before processing, are ripened with ethylene gas after premature picking, and are commonly bathed in lye or other caustic solutions to loosen their skin for peeling. Even most organic brands contain excess harsh refined salt and the preservative calcium chloride. In refreshing contrast Eden Organic Tomatoes are naturally ripened on the vine before picking, grown with no synthetic fertilizers and cooked with no chemical additives. We leave them unpeeled, or naturally peel with hot water and brushing. Compare to taste and see the Eden difference. Eden Organic Tomatoes are ideal for making creative homemade pasta sauce, soups, stews, and casseroles, or simply to heat and serve as a side dish. In 14.5 and 28 ounce white enamel lined cans, nine flavors and 12 sku's, each is certified organic and kosher parve.